IIR digital filters faithfully simulate analog filters (active or passive), approximating phase and frequency behavior. Like their analog equivalents, they are affected by unavoidable phase rotations at the cut-off frequency, which are different based on the type of curve used (Butterworth, Linkwitz, Bessel), however still perceived when listening. 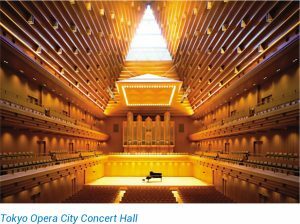 In practice, for instance, a fourth-order low-pass IIR filter (24 dB / Oct) at 200 Hz cut-off, plus a high-pass symmetric filter, results in a phase rotation ranging from 0 to -360 degrees along the whole audio spectrum. This phase alteration affects the perception of the sound image, which highlights inaccuracies in terms of coherence and stability. 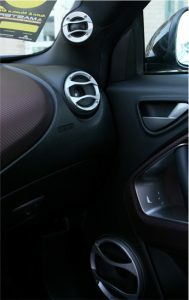 Think of a 3-way system where the door-mounted 18 cm woofer is 400 Hz crossed with the middle-range, installed on the a-pillar next to a tweeter, itself crossed with the middle-range at 5.000 Hz, using crossovers with IIR filters. 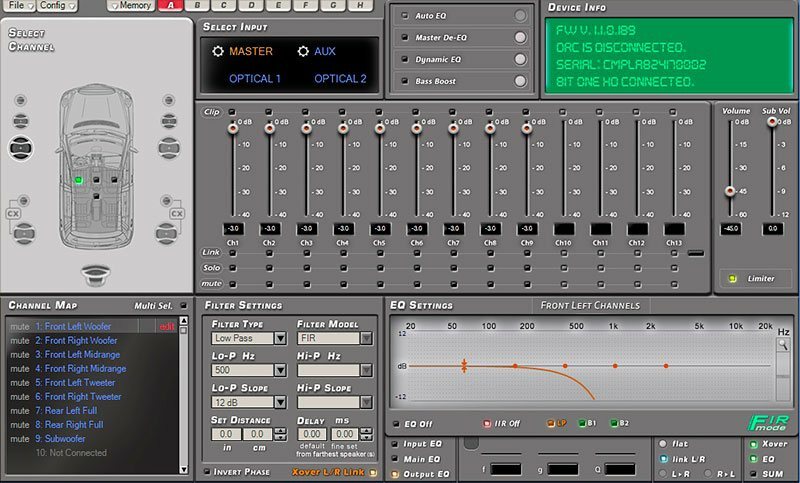 The system phase alteration reduces the focus of the instruments on the virtual stage. For this reason, a number of audio enthusiasts prefer to adopt 2-way systems with a woofer and tweeter crossing at 2.500 Hz with a slope of 6 dB / Oct, so as to limit phase rotations as much as possible. This solution, however, presents a number of significant disadvantages, mainly due to increased distortion and lower tweeter power. With a slope of only 6 dB / Oct., the music signal around the cut-off frequency is simultaneously generated by tweeters and woofers to a considerable extent. Since a tweeter and a woofer have very different electro-acoustic parameters, the sum of the two emissions does not produce clear output signals, which results in less clarity in the reproduction of musical transients. Similarly to crossover filters, graphic and parametric equalizers based on IIR filters alter the signal phase behavior with significant effects on audio quality. A heavily equalized signal is characterized by an unclear stereo image and lack of transients definition. Audiophiles often classify this feeling as a veil that blurs the musical message and deprives it of the necessary emotion. The use of FIR filters guarantees an important result: the phase behaviour is linear, free from rotations or indecisions. This also makes the use of filters with a very high slope (up to 48 dB / Oct) possible, without altering the phase response. 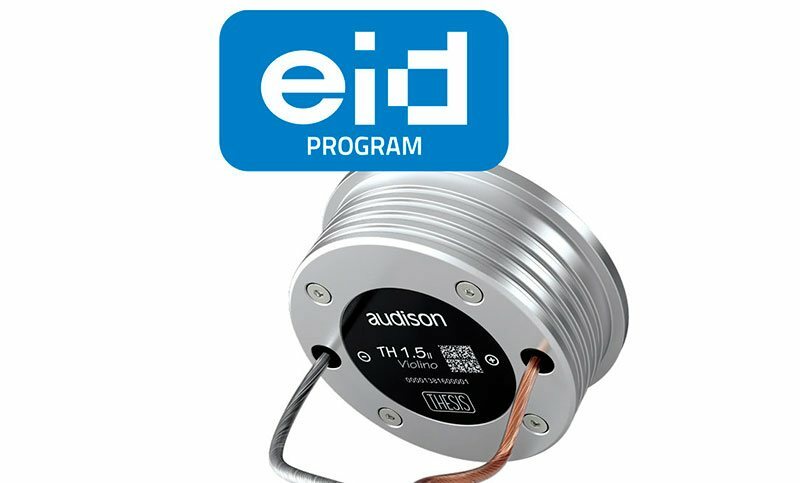 Such a high slope for the filter enables the midrange and tweeters mounted on the a-pillar to work at lower frequencies without any issues with power handling, thus raising the emission front. Therefore thanks to the FIR filters the advantages of three or multiple-way systems are completely exploited taking in-car listening experience to a different level. When listening, a system that uses FIR filters provides great clarity in transients reproduction, such as the acoustic piano hammer strikes or the drums. The stereophonic image is deeper and definite. Instruments in the virtual stage are more focused and seem to have more space between them. Even the intervention of any equalizer over the frequency response, when available in FIR technology, does not modify the audio signal phase, allowing more precise and detailed corrections without conditioning the audio quality. FIR filters therefore provide a better audio quality. So why are they used only by the bit One HD? Implementing a FIR filter requires the DSP chip to work with an enormous array of numbers and with much more complex calculations, and is therefore much more burdensome than the one of an IIR filter. As a result, the DSP Analog Device entry level chips of the “Sigma” family other audio processors are built with do not allow FIR filters to be used because the DSP chip does not have enough computing resources to handle this and other features. In addition, the processor control software that uses the SIGMA chips is generated using the “Sigma Studio” graphic interface, which provides a series of pre-set audio codecs to the developers and none of these codecs have FIR filtering. 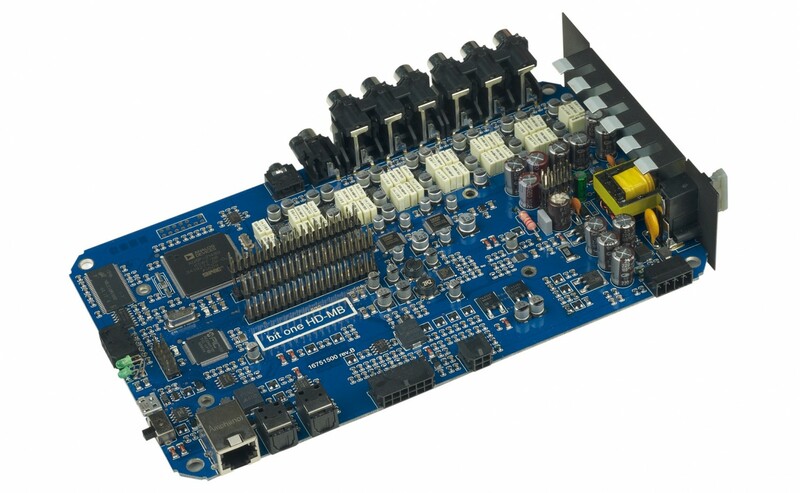 The bit One HD is the only digital audio processor for automotive use equipped with the SHARC series Hi-End Analog Device Processor ADSP-21489. This processor works with a 32-bit floating-point computing unit, a feature that provides it with a dynamic range far superior than the inexpensive fixedpoint “Sigma” used by other processors. However, the higher computational power and precision of the SHARC series DSPs requires expert hands to be exploited to the full. It is not enough, as in the DSPs of the “Sigma” family, to use the supplied codecs. That is why a development team with a deep understanding of algorithms programming for digital signal processing is needed. 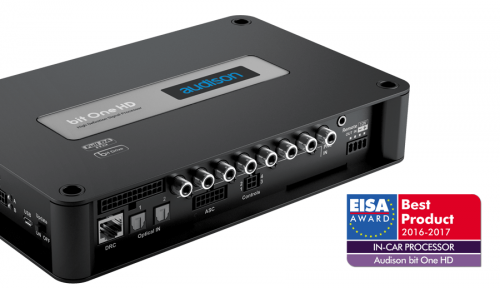 The experience in programming SHARC processors that the Audison development team has built since 2006, with the implementation of the bit One, has made it possible to reach a new level of audio quality for the bit One HD. A new software allows the user to exploit the whole power of the SHARC processor by employing FIR filters on a 9-channel output platform enabling the creation of high-performance audio systems up to 4-way + subwoofer. 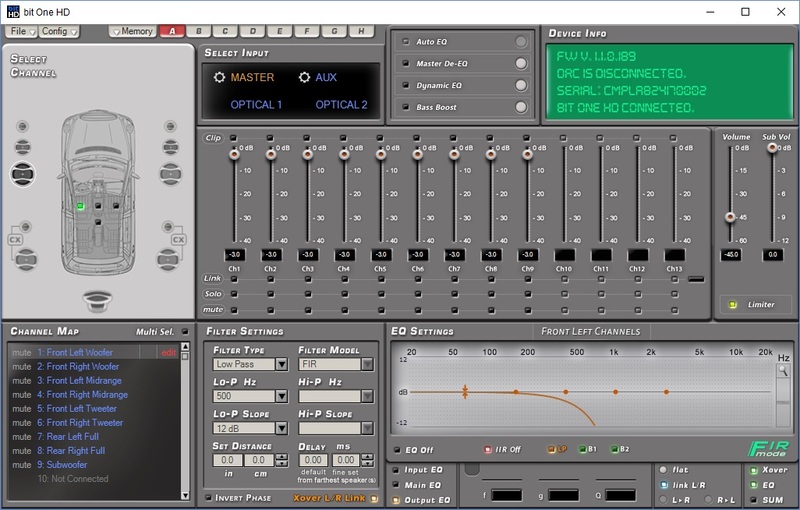 The result is a quality of sound signal processing which is deeply different from any other DSP. This unique listening experience is achieved thanks to the excellent work of the development team and to the state-of-theart SHARC DSP, raising audio quality to a level never reached before.